Harry’s Bar & Terrace is a particularly lively and friendly part of Airdrie's premier hotel, The Tudor. This highly popular area has just undergone an amazing transformation into an opulent and irresistible hotspot. 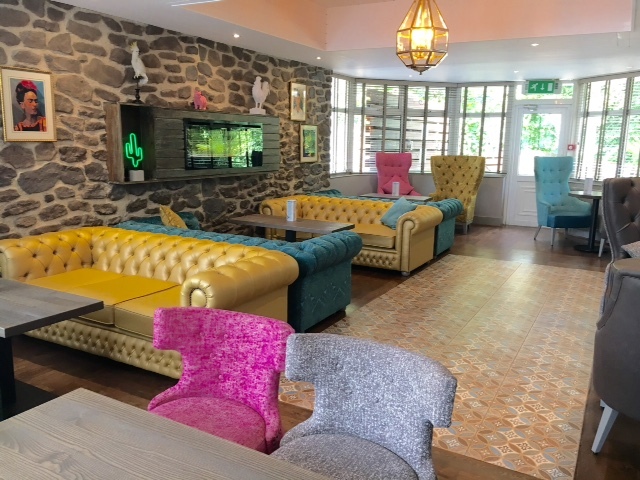 Select Contract Furniture, having already worked for the Moylan family on many areas of the hotel over the course of many years, were delighted to once more be nominated for this dramatic transformation. The bar is now cosy and inviting, with original stone walls and plenty of feature wall coverings plus you can nestle near the feature fire or sink into the superb leather effect booths. Solid timber table tops with exposed grain surface stained to wood grey driftwood, stunning deep-buttoned feature high back chairs, beautifully crafted chesterfield sofas plus a host of other chair styles and high stools all upholstered in a selection of various velvets, boucles and faux leathers. All this contributes greatly to the inviting and jovial atmosphere that makes the hotel so popular for locals and tourists, as well as cementing its popular position as a haven of good times and great Scottish hospitality.